Excitement is building at the Pope County Museum, as more than 30 brightly wrapped baskets of goodies are being filled and decorated for our Christmas open house. The annual Christmas open house will be on Saturday, December 5th, 1-4:00. 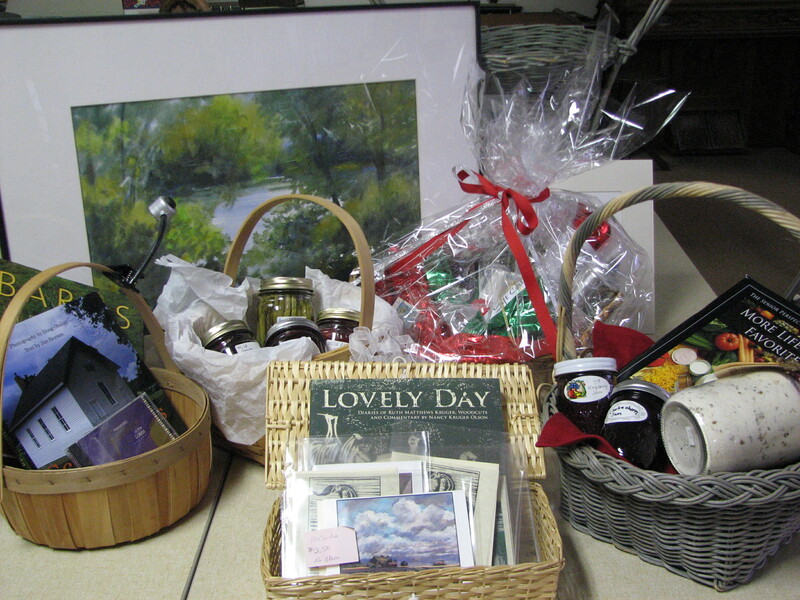 This year’s open house has a special feature – a gift basket silent auction. PCHS board member, Wendy Zander, has worked diligently gathering merchandise, handcrafts, art, entertainments, diversions and gift certificates. Many baskets were assembled to relate to exhibits in the museum gallery. There will be home made wooden bird feeders from 4-H members by the woodshop exhibit, a road trip basket with goodies and essentials for a Sunday drive by the 1914 Chevrolet Baby Grand touring car, and a “diaper cake” in the children’s nursery. 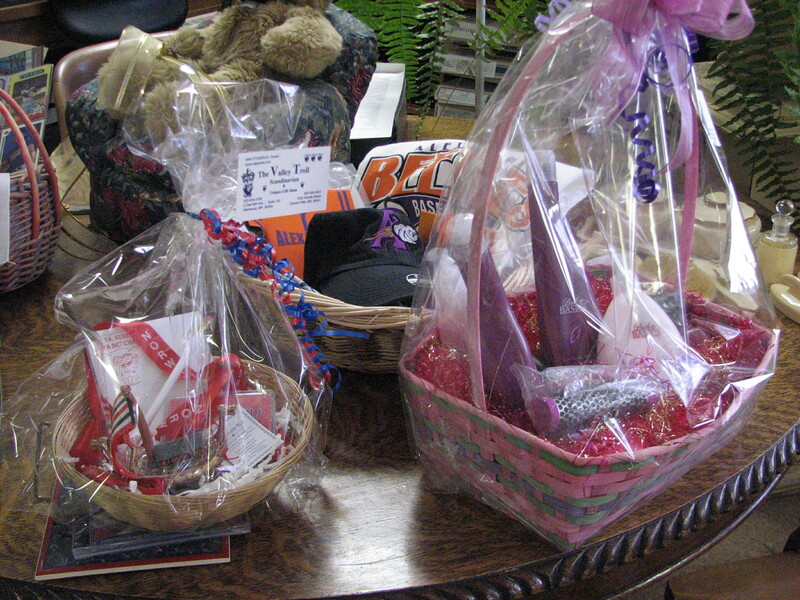 To make sure that everyone has an opportunity to bid on these great baskets, the open house lasts all week! The Museum will be open free of charge, 10 a.m.-5 p.m., December 1-5. The baskets will be on display and bidding will start Tuesday, December 1 and will end Saturday, December 5 at 4:00. Some other items up for auction include: Ski and tubing passes from Andes Tower Hills along with hats, hot chocolate and hand warmers; prints and note cards by local artists; Curves Membership, with water bottle and pedometer; hair care products from Milady Milad and Profiles by Janel, gift certificates to area businesses; and a family pack from the Alexandria Beetles including tickets to baseball games, t-shirts, hat, ball & autograph book. The baskets also include some fun events such as a home cooked wild game dinner with Chris & Tara Nelson; a special tea party; a round of golf on the Pezhekee National Golf Course and an evening or weekend day of ice fishing out in Jim Schroeder’s fish house complete with underwater camera. Food items play a prominent roll as well. You can bid on dessert, casserole, or soup baskets that include everything you need to finish the recipe from all the ingredients and even the pan! Keep and eye out too for baskets of jelly and pickles, seasonal pies delivered through the year; even a few special bake sale goodies. “The Pope County business community and museum members have been very generous! We know you will be impressed with the fantastic selection of baskets. We had great fun building theme baskets relating to museum exhibits,” said Wendy Zander. Stop by the Pope County Museum between Dec 1-5, check out the exhibits and place your bids. While you are there you can check out your family file in the archives. This entry was posted in Museum updates and tagged Alexandria Beetles, Andes Tower Hills, Christmas, Curves, Milady Milad, Open House, Pezhekee National Golf Course, Profiles by Janel, Silent Auction. Bookmark the permalink.